Last week, Microsoft announced its first flagship smartphones for quite a while now, the Windows 10 Mobile-based Lumia 950 and Lumia 950 XL. Although Microsoft did manage to draw some initial interest from potential customers in the US, the company will intentionally limit the availability of its phones in the US. Just a few hours after Microsoft's event ended, AT&T announced that it will sell the Microsoft Lumia 950 through its channels, with the announcement failing to mention any details about a possible exclusivity. As days passed, what followed was a mixture of reports, rumors, and unofficial statements from Microsoft executives regarding a possible exclusivity arrangement. 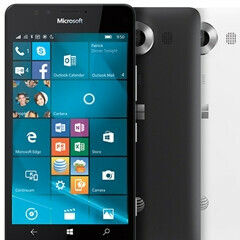 A few days ago, CNET reported that the Microsoft Lumia 950 will be an AT&T exclusive as no other major carrier in the US has shown interest in the smartphone. T-Mobile CEO John Legere was quick to react to this report and raged on Twitter about how the Magenta carrier did not refuse to carry the new Lumia flagships, but that Microsoft simply offered it to AT&T as an exclusive. Hours later, CNET updated the original report to state that the Lumia 950 will not be an AT&T exclusive, but did so without providing any explanations. We’re refocusing our channel strategy, narrowing it in the short-term and planning for broader operator availability long-term. [...] While there was interest across the board from U.S. operators, currently we’ve made the decision to have AT&T carry the Lumia 950, and then sell both the Lumia 950 and Lumia 950 XL unlocked through our own channel in Microsoft stores. In Europe, Deutsche Telekom will carry the Lumia 950 and Lumia 950 XL, and we’ll have more to share about other carriers shortly. What this means is that the Lumia 950 will be carried exclusively by AT&T at launch, and that broader availability will probably follow at some point in the future. One interesting detail to note is that AT&T did not mention the Lumia 950 XL in its announcement, which probably means that the carrier will only offer the smaller Lumia 950. Although AT&T did strike some luck in the past through its exclusivity deals (hello pre-2012 iPhones), its recent exclusivity deals translated into flops for the manufacturers. Examples of such failures are the Amazon Fire Phone and the HTC First "Facebook Phone". Fortunately for any T-Mobile subscriber who has fallen in love with the new Lumia 950, you don't have to wait it out for the companies to kiss and make up. Microsoft will sell both the Lumia 950 and the Lumia 950 XL unlocked from its online store, and these phones will be compatible with both AT&T's and T-Mobile's networks. If you're on Verizon or Sprint, you're completely out of luck for the moment. What do you guys think? Would you get the Lumia 950 or the Lumia 950 XL on Verizon or Sprint if given the opportunity? The term DOA comes to mind. Good going Microsoft! PEOPLE, read the source quote...there is another interpretation for this information. Microsoft is partnering with AT&T on the Lumia 950 as the only carrier in the U.S. to subsidize and promote the phones. However, the Lumia 950 and 950 XL will both be available unlocked directly from Microsoft -- just not subsidized through your carrier. My guess is that broader availability later down the road only applies to carriers with more fringe requirements, such as CDMA for Verizon and Sprint. I received my windows tablet. Windows is very smooth and fast and very user friendly. Better than ios. Interface is very familier, just like desktop windows. It took me only 5 minuts to get used to with it. But Ppl are right about apps availability. Almost all apps which I use are none existant on windows. I hardly find few apps which I can count on my fingers. Windows is light years behind in apps and I can imagine, how boring it will be to use windows for a long time. Only good thing is hyper for youtube and tubecast are better than original youtube. My guess since you have a Windows tablet is that you can still use desktop apps and web apps. I have a Dell convertible laptop/tab (keyboard swivels 360 degrees) and although apps are lacking, I can still load desktop apps and use web (for example watch YouTube or Amazon Prime Video using browser). Stupid They Should At Least Include The XL In The Deal. I mean, fine. Make the phone an AT&T exclusive. But why didn't Microsoft make the unlocked version CDMA capable? It couldn't have been that hard to throw in the proper radios and bands necessary to allow the unlocked versions to work on Verizon and Sprint. It's intentionally shooting themselves in the foot, and is basically a giant f**k-you to any Verizon and Sprint WP fans. You're not Android, Microsoft. People are willing to spend $400+ on an unlocked Android phone. Yours...no. Another DOA Windows Phone. DEAD ON ARRIVAL! Next phone please! anyone know if Microsoft is still working on a true surface phone? You know the one that when you connect to a monitor becomes a real computer, not some weird big screen mode phone. If it uses an Intel CPU, then yes. So, will Microsoft also sell it unlocked in the U.S.? By this post it seems like At&t will sell their version and MS will sell the unlocked version. Carrier exclusives actually make sense for phones that have no demand. If no one buys it's, no one buys it and you will have a warehouse of At and t branded phones sitting in one warehouse. The free advertising and marketing that is on the At and t contract is a bonus. If they released it on all carriers, you would have phones sitting in multiple warehouses with all big four Carrie branding. The former sounds way better than the latter to me. Microsoft made the right move no matter what the windows phone fans think. They are almost as delusional as HTC fans. Wider availability and marketing doesn't always work. Sometimes you just spread your wares too thin when it's better to concentrate them in one area or market. There are already several phones on the market that support the necessary frequencies to work on ALL four carriers. The new Nexus comes to mind. It's not like it's expensive to include these radios. Instead of having all these exclusives, just launch ONE phone that supports them all. If MS did it this way, overstock issues wouldn't be a problem. To be honest, the majority of customers (nobody who reads a website like this) actually believe that the carrier branding means that these devices are manufactured by the carriers. I say cut the branding all together, except for those from the companies who actually make them. Carrier branding is not a choice by the OEM, it's a stipulation by the carrier. Only the iPhone is exempt from carriers branding or changing the phone, and only then because it is the best selling phone on the market year after year. Its not all about frequencies, its about fundamental differences between how CDMA works vs GSM. The majority of the world uses GSM and the minority uses the antiquated CDMA technology. It is much more expensive to make a phone that works on CDMA networks or that works on both. By going with GSM, as usual, Microsoft is targeting the majority of the world. Ms, why did u bought nokia's mobile services. If u don't know how to sell phones. What are you talking about? Even nokia themselves used to do thes practices. I like your way of thinking good sir. Yup! A time tested, sound strategy. Works well with all smartphone brands. Its just a matter of how long is the wait. Lumia about average 3 to 5 months, Samsung around 4 to 6 months. For Apple, its going to be 11 months to a full year. If you don't want your phones to sell Microsoft, just give it up. Stupid move for something major as this. Major tech sites like cnet and PCMag have as much as pronounced the new Lumiae dead on arrival. They're just good enough, nothing more. MS just isn't that committed to them. They were way more excited about the Surface Book, and they're probably prepping a Surface Phone and don't want everyone paying too much attention to the old (Nokia) product line. They had to release something though. It had a stylus, 5.7 in screen,keyboard and all! Maybe that's where they need to head. Make phones even more functional, play up Continuum, basically have your phone do anything a PC can do. Until then though, Windows Phone 10 looks a lot like Windows Phone 8.